Mohamed Salah is fit for Egypt's World Cup group match with Russia on Tuesday, says the Egyptian Football Association. 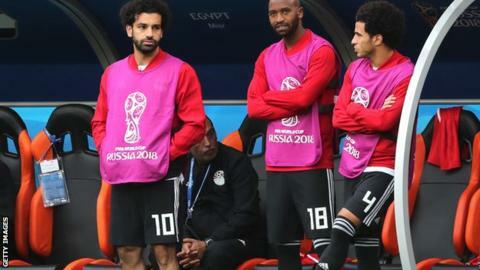 Salah, 25, was an unused substitute in his country's 1-0 defeat by Uruguay in their opening group game on Thursday when he was also declared fit. He injured his shoulder playing for Liverpool in the Champions League final on 26 May. "He was fit to play against Uruguay but the coach did not want to take the risk," said the EFA. Without Salah, who scored 44 times for Liverpool this season, Egypt lacked a cutting edge but had looked on course to earn a point in their first match at a World Cup finals since 1990 before Jose Gimenez's 90th-minute goal. After the game, Egypt coach Hector Cuper said: "Mo Salah is an extremely important player for us, nobody can deny that, but you need to have a good team, and we have a good team. "Perhaps if Mo had been on the pitch today the outcome would have been different but we can't know that. "Certainly he has contributed a great amount to the team and will contribute in future matches. "We wanted to avoid any risks in this match, but I think he will be fine for the next game." The EFA added that midfielder Tarek Hamed, 32, will also be fit to face Russia at the St Petersburg Stadium after he left the pitch against Uruguay with a back injury. "Hamed had an X-ray and he is good and will be fit for the second match," they said.